Touch Arcade at GDC met today with Stephane Portha of Eurocenter and had a look at several impressive upcoming iPhone and iPad game titles that will arrive from the studio in the coming months. Eurocenter is readying an iPhone version of the open source artillery game Scorched 3D developed by Gavin Camp, itself a modern take on the classic, 2D title Scorched Earth. The studio has gotten Camp’s blessing on this enhanced iPhone port and, down the road, intends to submit progress made on the iPhone version back to the core project. 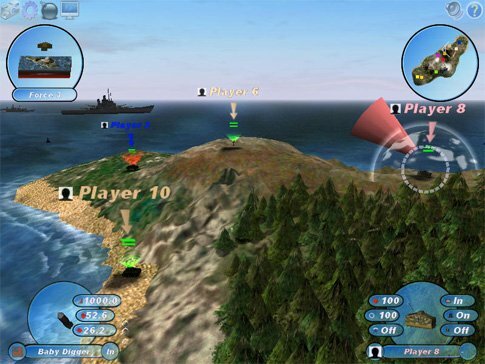 Scorched 3D for the iPhone, like the open source desktop version, is a turn-based game that presents the player with a series of islands to defend by means of highly controllable artillery weaponry. The task at hand is to take the lay of the land and aim your turret at the enemy’s tanks as best you can by adjusting the angle, rotation, and power of your ordnance. Cash is earned by successful hits and can be used to purchase a variety of available weapons, including dirt clods, missiles, napalm, and nukes (some, obviously, being more effective than others). Once you’ve made your adjustments, pull the trigger and your turret, as well as your enemy’s, will exchange fire and find out where the carnage will lie. The iPhone version features a combination of drag-control to manipulate the camera angle and slide-control to turn two onscreen aiming gears. The visuals in the game go beyond the desktop version and, along with the fluidity of the animation on the 3rd Gen iPod touch demo device we previewed, are highly impressive. What’s more, iPhone 3GS-class devices feature real-time shadows and shader effects that add to the eye-candy. Interestingly, the title will be released as two separate games. The first release will feature single-player modes as well as on-line head-to-head action. It will follow the “freemium" pricing model that, in the base release, will offer the full game experience, with an option to pay in to gain more money, islands, and weapons for those wanting to move things along more quickly, as opposed to spending the time required to progress through the game the hard way. A second release will follow, that delivers an MMO-type experience where many players can compete to amass islands, defending them against other players in an ongoing game world. It’s really a sort of heaven in your pocket for all the Scorched Earth fans out there. See our gameplay video for a look at the title in action. The initial release of Sorched 3D for the iPhone is expected to appear in the App Store in late April. Stay tuned for a closer look when the game goes live.